It seems to be inevitable that each new generation dismisses the “antiquated” practices of the generation before – often leading to the extinction of those practices. When I was an Art student, I studied art pieces that were made using methods long since lost to time. The skills died with “advancements” in technique and technology. Of course we still make art, so what’s the loss? Well, the real loss is that those techniques yielded rich looking, highly detailed art – qualities that have eroded as we’ve allowed technology and simpler techniques to intervene. I know, some of you are saying, “But art is a subjective medium. Some prefer today’s art, and don’t miss those lost techniques. And what does it have to do with horses, anyway?” It has more to do with horses than you might think, and in ways you may not imagine. First, the inspiration for this post. This weekend was a dental weekend for the horses. 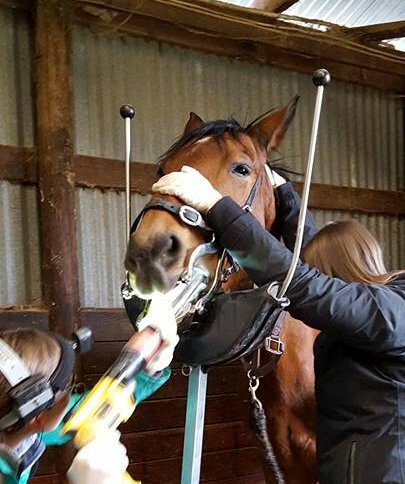 As many of you probably know, today’s equine dentists use power tools. In this case, a field unit from a local veterinary clinic came out to give everyone’s teeth a once over. In conversation, the topic of manual floating came up. For those who don’t know, that was back in the day when the veterinarian had hand-rasps, constructed just for a horse’s mouth, and built their arm muscles rasping away the points and waves. I’ve helped my vet with many a manual teeth floating over the years that I worked for her … and since, with my own horses. The vet visiting today made the comment that “you can’t do much with manual rasping.” I could easily quarrel with that, knowing the kinds of cases we worked on and the improvements made … albeit with lots of sweat involved. But I chose to keep my thoughts my own. Then she said the thing that inspired this post: “I graduated in 2012, and they never even taught us to manually float. There was no point.” Therein lies a problem she is unaware of, that goes much deeper than how your horse’s teeth are cared for. We live in an era of medical tests and machines. I’ve felt the results as a patient, but I will speak to what I’ve noticed as a horse owner – machines have replaced “feel”, and that is not a good thing. When I was a teenager, I was lucky enough to have encounters with Dr. J.D. Wheat, at our local veterinary school. In his time, he was known internationally in the racing world. He was frequently flown by European and Middle Eastern billionaires to check out high priced Thoroughbreds; and he was guest lecturer at many a European veterinary school. But first and foremost, Dr. Wheat was an old time horseman. He’d grown up following his father, who tended horses at farms and mills. Dr. Wheat could feel a leg and describe everything he felt in full detail. He could predict how that horse would move off – whether it would be sound, or how it would compensate for any specific injury. I took my gelding in for a subtle soundness problem that another vet at the clinic couldn’t see. Dr. Wheat walked up, and without any information given, perfectly described exactly what was happening … then set about teaching the other clinician how to see it. I’ve been lucky, for thirty five years, to have a vet that was mentored by Dr. Wheat. She can palpate any part of a horse, and describe in perfect detail what later is confirmed by modern tests. So, we have tests for that, right? So what does it matter? Well, my vet can tell things the machine can’t – like how much pain is associated with the given problem, or how soft or tender an ovarian follicle is (while the machine can only give size). I’ve watched for years as she has brought horses back to soundness, or gotten mares in foal, that other vets had long dismissed. There is more than just diagnostic ability that goes into learning how to feel what ails your patient – it also brings you closer to the individual, and teaches you an empathy that looking at a screen will never bring. My experience this weekend is not the only evidence that those valuable skills of looking and feeling are being lost. Being in the vicinity of a veterinary school, my vet is often asked to take on interns. Over the years, the horsemanship skills of the interns have gone down, as science requirements trumped animal experience for admission. But in recent years she’s noticed that some basic skills are missing from their education – they can’t palpate a leg, check a mare in foal through palpation, or tell you which leg is lame. She began to ask her contacts at the veterinary school, and has been told that palpation (among other techniques) was no longer needed with ultrasound, scopes, MRI and other technology. Veterinary students are spending more time studying machines than studying animals. This is not a condemnation of veterinarians or veterinary students – most that I meet are very nice people. They can’t know what they don’t know – and it’s our modern tendency to be as dismissive as the vet doing my horse’s teeth this weekend. Everyone is using power tools, therefore it must be superior to the past manual ways, right? Yet I have still seen situations where manual floating resolved a problem that could not be solved by the power tools. My vet has even shown her own equine dentist a thing or two! There is much that can and should be learned from the people who have honed a skill over a lifetime. They’ve forgotten more than the current generation can imagine. Technology does not have the power to replace talent, skill, or long hours of experience. As an art student, I dreamed of finding someone who still practiced those old beautiful techniques. As a student of Dressage, I treasure any words of wisdom I can gather from the rare remaining masters. And as a horse owner, I dread the day that I have to rely on a veterinarian who sees my horse much the way my mechanic sees my car – as something to plug into a machine and get a reading on. So the next time you find an “old timer”, take a few minutes to learn a little of what they have to share! They, and your horses, will thank you for it. This entry was posted in Thinking Out Loud and tagged craftsman, education, equine dentistry, horsemanship, learning, lost arts, lost skills, palpation, skills, soundness, technology, veterinarians. Bookmark the permalink.